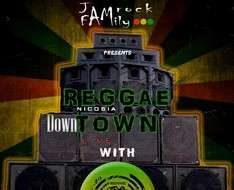 JamRock Family presents "Reggae Town" vol2 with "Roots Crew Sound System" on DownTownLive! The musical culture of the Reggae Sound Systems, born in the 50s in the Kingston slums in Jamaica, is constantly evolving and spreading worldwide. The Cypriot Roots Crew Sound System, for the last 18 years, have been promoting these rhythms all over the island. With their hand-crafted audio system, their vinyls and choices, especially from the 1970's, carry messages influenced by the oppression of colonialism, racial discrimination, rastaffism and share music that praises human rights, freedom and equality.